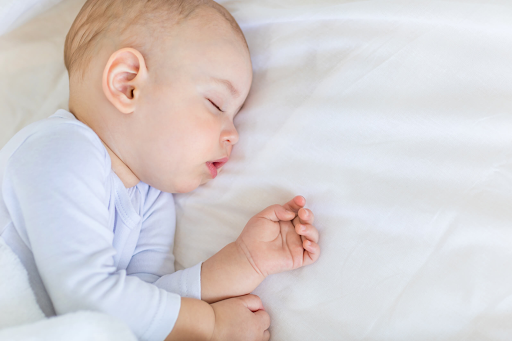 There are so many reasons why your baby might not be sleeping through the night. Chances are, you are exhausted too and will try anything to get some rest yourself. If your baby is not sleeping through the night, your sleep patterns are effected and you are probably feeling drained of energy and constantly tired. It is important to know that babies continue to wake up during the night for many months, even if they aren’t hungry. Eventually, babies should figure out how to sleep through the night on their own, but there are some things you can try if you are having a hard time coping with the lack of sleep. Sleep training is the method of teaching your baby good sleep habits and help them become more independent. There are many different sleep training methods, but it is up to you to choose what is best for your baby. This training method is a very gently, not a cry it out method, where you “fade it out.” Meaning, you continue to help your baby to fall asleep by rocking, feeding, or singing, but over time, you do less of the “work” of putting your baby to sleep. You shorten the amount of time you rock, or only sing one lullaby instead of three. With this method, the baby is still being soothed and has a regular bedtime routine, but does require more patience from the parents, as it is a slower process. This is another gentle sleep training method. Pick up-put down works as it sounds. When your baby is trying to go to sleep in his or her crib, you pick the baby up until he or she is calm and sleepy. Then, you put the baby back down, repeating the process until the baby is asleep. This method also requires a lot of patience, especially if your baby is particularly stubborn. This method involves a little more tears that the other two, but you don’t leave your baby in the room. The chair method works by doing your normal bedtime routine, and put the baby down to fall asleep. Place a chair or rocker next to the crib; this allows your baby to be comforted by your presence as he or she tries to fall asleep. These are only three sleep training methods. There are so many ways to try to get your baby to have a healthy night of sleep, so you can pick the best method for your little one.